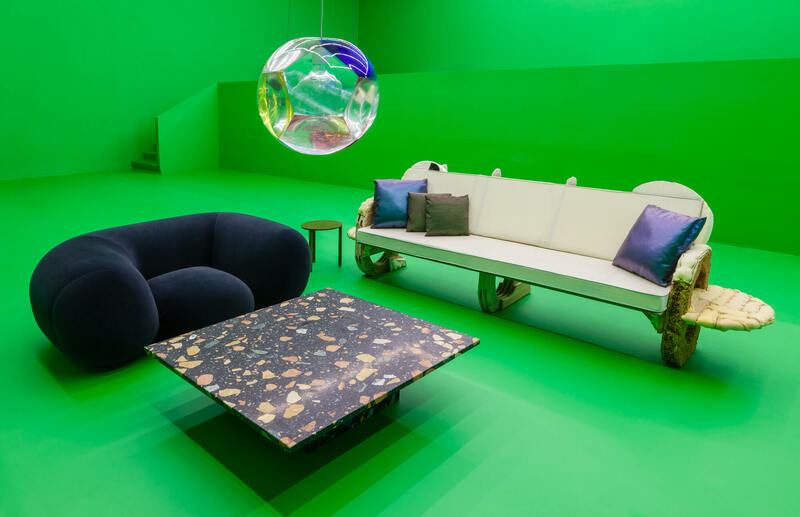 It’s a challenge to predict the color combinations and trends that will be popular years from now, but a new design show at the Swiss Institute in New York has a bold prediction: bright green, as in the color of green screens. The gallery’s new design and architecture show Pavillon de l’Esprit Nouveau: A 21st Century Show Home, offers a digitally native take on décor, complete with a green screened interior that projects guests onto an array of animated scenes and scenarios. Including so much screen time in the show may seem disruptive, a comment on our increasingly tenuous sense of place. But it doesn’t take away from the furniture pieces on display, a mixture of sly references, material experiments and social commentary from more than 30 international designers that do justice to the source material. ’s Marmoreal Coffee Table is made from waste from a marble quarry set on slabs and reused, and the bed sheets were made from a futuristic artificial fabric created by Konstantin Grcic. The room displays offer a further dose of futurism via green screen technology, with those walking the gallery floor finding themselves and the furniture projected into surreal environments, such as a desert wind farm, broadcast set of flat screens. It’s a slightly chilling look at what’s to come, occasionally sterile and often comical, in the case of the hybrid gym-office with executive hand weights, or the stylish conical cane designed by Leon Ransmeier.